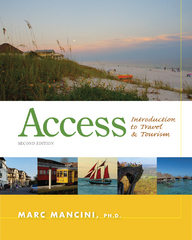 Access: Introduction to Travel and Tourism 2 Edition Practical and easy to understand, the second edition of ACCESS: INTRODUCTION TO TRAVEL AND TOURISM is designed to prepare readers for a successful career in the travel, tourism and hospitality industry. This edition has been updated to include new content and expanded topics in order to ensure that readers understand all facets of the travel business. With updated coverage of technology,new profiles of industry leaders additional activities, refined graphics and full-color photos, this concise book provides readers with a wealth of practical information designed to help them refine their research skills, respond to real-world scenarios, identify key concepts, and remember critical information.